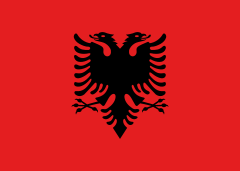 2005–06 Albanian Cup (Albanian: Kupa e Shqipërisë) was the fifty-fourth season of Albania's annual cup competition. It began on 28 August 2005 with the First Round and ended on 10 May 2006 with the Final match. The winners of the competition qualified for the 2006-07 first qualifying round of the UEFA Europa League. KF Teuta were the defending champions, having won their third Albanian Cup last season. The cup was won by KF Tirana. The rounds were played in a two-legged format similar to those of European competitions. If the aggregated score was tied after both games, the team with the higher number of away goals advanced. If the number of away goals was equal in both games, the match was decided by extra time and a penalty shootout, if necessary. Games were played on 28 August – 4 September 2005. Games were played on 20 September – 27 September 2005. All fourteen teams of the 2004–05 Superliga and First Division entered in this round, along with Second Round winners. First legs were played on 19 October 2005 and the second legs were played on 26 October 2005. In this round entered the 8 winners from the previous round. In this round entered the four winners from the previous round. This article is issued from Wikipedia - version of the 10/19/2013. The text is available under the Creative Commons Attribution/Share Alike but additional terms may apply for the media files.